Heartbeat: Voices of First Nations Women was produced in conjunction with the 1995 Smithsonian Folklife Festival program of the same name. 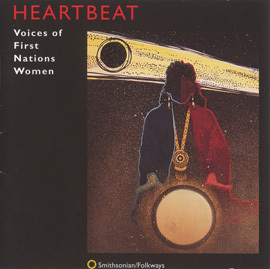 The album was so successful Smithsonian Folkways produced a follow-up, Heartbeat 2: More Voices of First Nations Women, in 1998. "A woman hums songs to a child. Three old ladies sing as they pick chokecherries or cactus buds, husk corn, or dig camus root. A woman's high-pitched lu-lu-lu-lu rises over the men's voices at the end of an honoring song for returned veterans. "Chorus girls" back up the men's lead song at the drum during a war dance. The pulsating, driving hand-drum beats and magic-making songs at a stick game. The songs that make the Sun Dance circle right. These are the voices of Native women. Like the drum whose heartbeat is that of a woman, these women and their songs are at the heart of Indian Country. But unlike the drum, their songs and voices are rarely heard beyond their communities." This recording documents the rich variety of musics by Native women. Included are traditional women's songs from tribes in the United States and Canada, as well as material usually sung by men and recently taken up by women. The recording explores songs of ceremony and tradition, home and family, religion and politics, and features instrumentalists, vocalists, choruses, and songwriters. Artists such as The Six Nations Women Singers, Joanne Shenandoah, Lillian Rainer, and Buffy Sainte-Marie demonstrate a range of traditional, innovative, and contemporary stylings. Very little is known and appreciated about Native American women's voices and songs, even among those who are familiar with Native American music. Most Native women's traditional singing takes place in the private, domestic settings associated with family, clan, ceremonial, or work activities. Those who are outside of these traditions rarely see or hear women sing, leading to the unfortunate misperception that women have little presence or significance in the performance and preservation of Native musical traditions. The numerous, diverse, and powerful voices on Heartbeat prove otherwise. Native women's musical traditions—and the Native women themselves—are resilient. Many traditional songs remain in their original form, despite years of missionization, acculturation, and the "civilization" policies of the USA government. Some artists are merging old ways with new technologies and speaking to contemporary wounds and current issues of domestic abuse, alcoholism, environmentalism, and threats to Indian sovereignty. The artists of Heartbeat demonstrate that Native women's music is vital and dynamic, and an important part of the process through which Native peoples everywhere are preserving and revitalizing their lives and cultures.